Nita came to PDG in search of something great that would help boost her corn and nacho catering business. She was looking for a promotional canopy with her own custom graphics and branding on it. She found us online, contacted us, and that’s where things got interesting. After carefully discussing the design details and a bit of collaboration, we settled on an overall design and went to print. The end result was a vibrant, fun canopy that was sure to get the attention of hungry folks passing by. Nita’s tent wasn’t just an ordinary 10x10 pop up canopy, it was a fully decked out promotional powerhouse. She didn’t want a normal tent set up, she wanted to go “all out” with the tent, and that’s exactly what we did. This bright tent features a double sided printed back wall as well as half mesh side walls with windows, for handing out food. The side sections were equipped with countertops, for anyone that might need condiments or napkins and utensils. Every square inch of this tent is covered in custom graphics, which includes all four top panels and four valances of the tent top itself. On top of that, she also got a branded table cover. We weren’t kidding when we said she went all out. The bonus inflatable corn is that special little cherry on top. The benefit of branding your entire tent is that it can be seen from any angle. Not all customers will be approaching from the front. If people approach from behind, they’ll see the printed graphics on the back side of the back wall and the back section top panel and valance. If they approach from the sides, they’ll see the messages on the side rails. Nita knew this, and that’s why she decided to get full branding on every section. Not only that, but customers respond well to a well presented marketing set-up, since it often conveys professionalism. If you have a nice looking tent, people will probably trust your brand more. Some people question whether getting a plain tent or getting a custom printed tent. Sure, many department stores carry plain pop up tents with very low price points, but what’s the point of getting something cheap that isn’t going to promote your brand? Some tent manufacturers obnoxiously brand their own tents with oversized logos, as if that’s going to help the customer. At PDG, we don’t do that. We leave 100% of the branding space to the client. With PDG tents, you get the best quality materials so it lasts a really long time. We want to make sure you get your money’s worth, and PDG tents will last you years. A custom printed tent can make the biggest difference over a plain tent any day. Which tent would you rather have? A plain one? Or a custom printed one? The obvious answer is the custom tent. Since we have a really talented team of designers and graphic artists, we can create a tent that will look however you want. Pick any color you want, bombard the tent with logos, or add images however you see fit. The possibilities are truly endless. With ultimate customization, comes complete originality. Don’t be afraid to ask for something that pops. Our designers will help you create the design of your dreams. Nita had her own design in mind, so she hooked us up with her designer and we got the ideas flowing. For this particular project, our design team collaborated with Nita’s designer in order to get the design as close to the client’s vision as possible. Without going back and forth too much, a design was settled upon and the tent went into printing. When it comes to build quality and warranty, PDG tents are second to none. Nita wanted a heavy duty tent, so she went with our best selling Dura Max aluminum pop up tent frame, which comes with an impressive 5-year warranty. Our Dura Max frame is made from 6061-T6 anodized aluminum, which will never rust. Along with reinforced connectors and thick tubing, Dura Max is meant for prolonged usage. 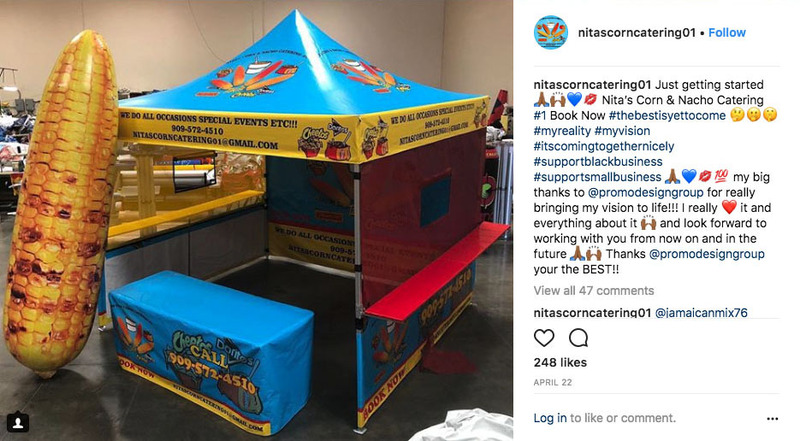 Nita plans on using her tent at many events, including personal catering events, which she specializes in. Setting this tent up and down over and over will cause wear and tear, but the trusty 5-year warranty will ensure everything goes smoothly in the unlikely event of parts breaking. 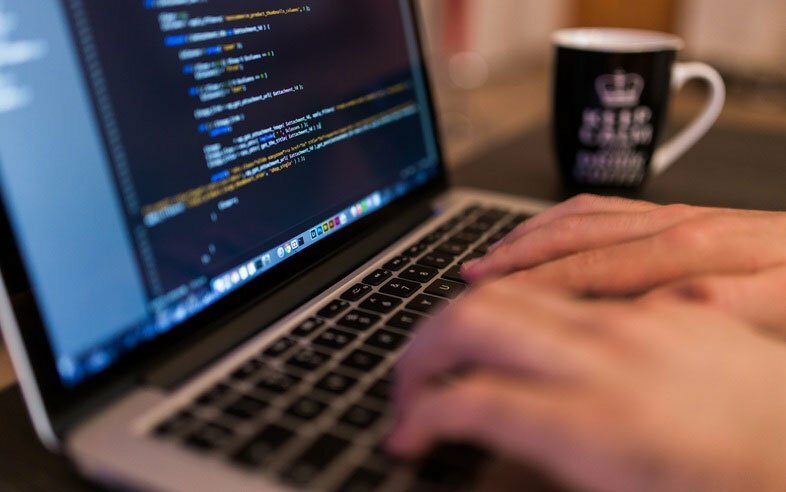 Having the right tool for the job is key, which is why so many companies invest in quality advertising and promotional products in order to create sales and revenue. A properly branded tent can make the difference between growing your business or shutting down permanently. Nita now has the right tools to improve her business, and she’s been going non-stop. Get that boost your brand needs.